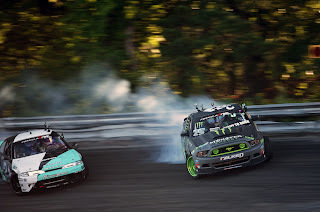 Vaughn Gittin Jr. came out to Formula Drift Round 4 “The Gauntlet” at Wall Stadium in New Jersey with hopes of success in order to gain some crucial points in the chase for the FD Championship. Not only did Vaughn accomplish that goal, but he also drove the Monster Energy Falken Tire Ford Mustang RTR all the way to 1st place after many extremely tough battles against fierce competitors. 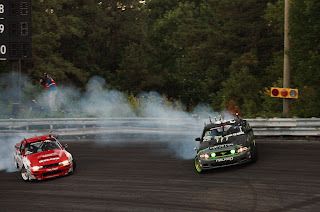 Wall Stadium is only a few miles from where Vaughn and the rest of Drift Alliance really began to hone their drifting skills back in 2002. 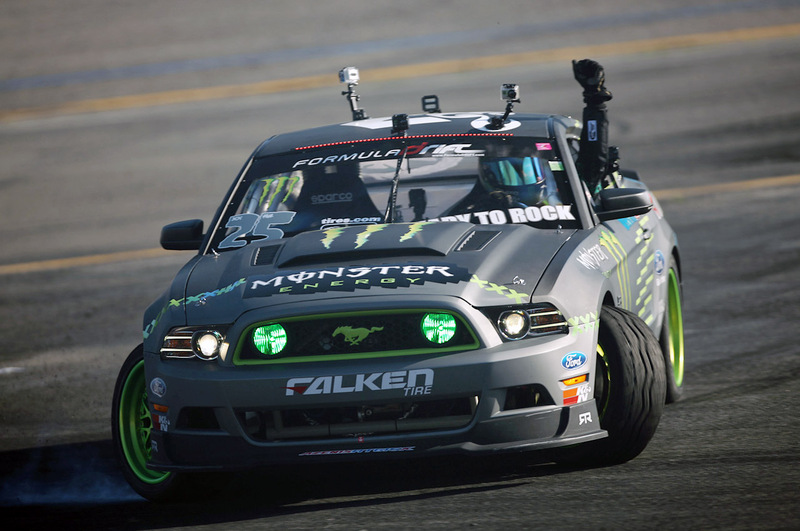 Now ten years later, Vaughn has reached goals that were once only dreamed about with a Formula Drift Championship and multiple wins/podiums in the books. 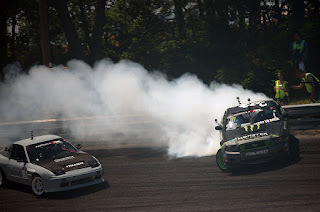 Round 4 at Wall Speedway saw another sold-out crowd and the live Drift Stream saw over 200,000 total views in a 24-hour period. 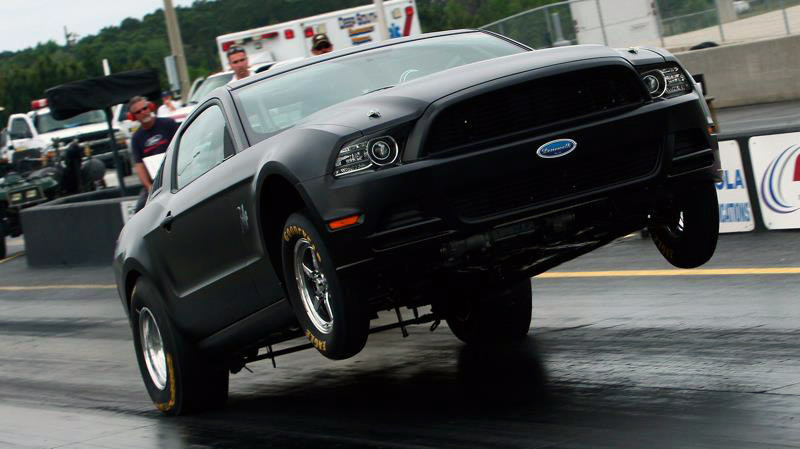 Even with Friday’s semi-wet track conditions, Vaughn was able to perform a near-perfect run that earned him a score of 96 and the second place qualifying spot. For Saturday’s main event, Vaughn fought his way to the semi-finals after beating out Miro Ovcharik in his battle of the top 32, Robbie Nishida in the top 16, and then Matt Powers in the top eight. 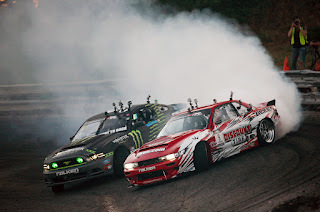 He met with his Drift Alliance brother and good friend, Chris Forsberg in the semi-finals; this would be a highly anticipated and very exciting battle, as these competitors are known for holding nothing back when lined up against each other. Vaughn would lead first, sweeping the bank and scraping the wall, leaving his rear bumper in the Falken Tire smoke pluming from behind him. He continued to blast through the course with maximum angle and put his car exactly where it was supposed to be as defined by the Formula Drift judges. When it was time to give chase, Vaughn followed Forsberg into the bank and remained glued to him throughout the entire run. 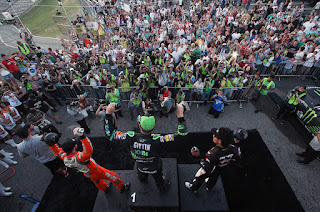 With a better lead run and closer proximity on the chase run, Vaughn earned the win and would move on to the finals to face his arch nemesis and Falken Tire teammate, Daijiro Yoshihara. 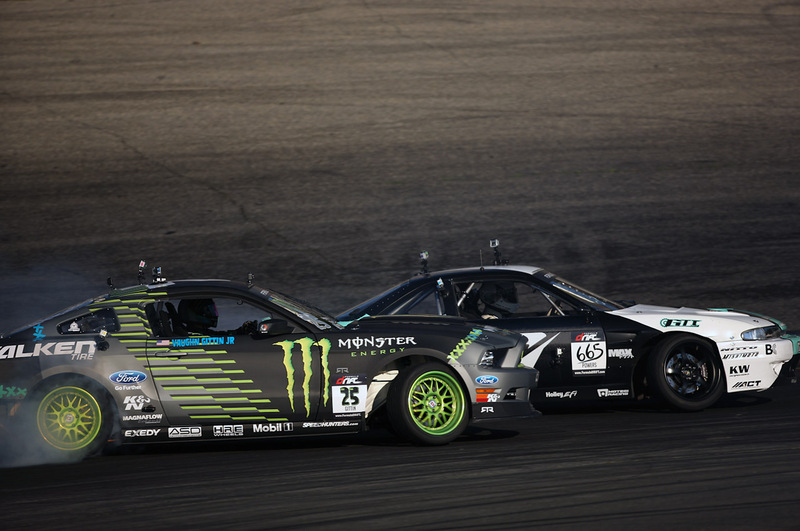 Yoshihara was the only competitor that Vaughn Gittin Jr. had faced numerous times and had never defeated. 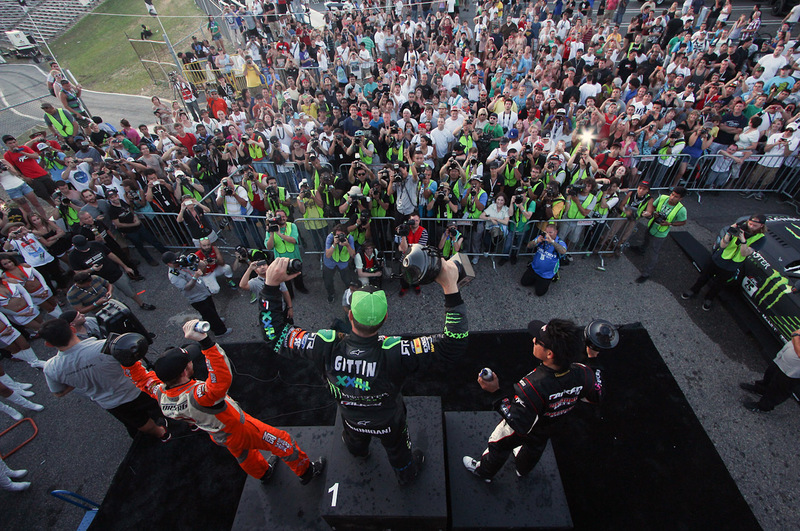 So besides the desire for the top step atop the podium, Vaughn wanted very badly to attain this win against his rival. Vaughn would lead first and put down an amazing run while Yoshihara pushed to stay close to the speedy Monster Energy Falken Tire Ford Mustang. 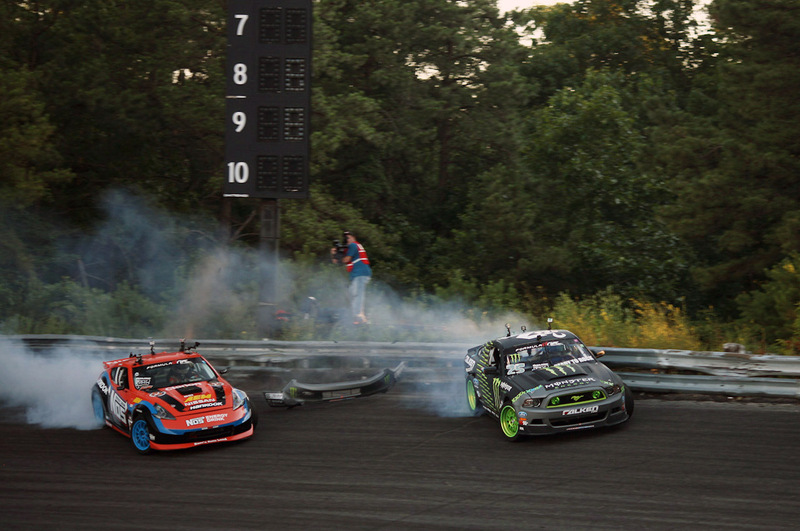 Vaughn’s competitor surged a little too hard going into the last turn, causing him to straighten up and giving Vaughn the advantage. 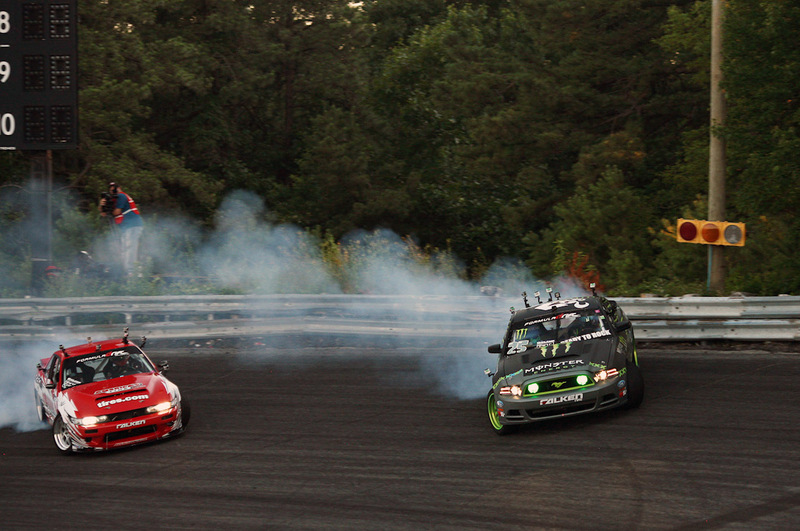 Vaughn would next give chase, and did not let up once while applying the pressure and sticking to his competitor’s door. Once the Falken Tire smoke settled on the track, Vaughn was deemed the winner of the final battle and 1st place overall at Formula Drift Round 4 at Wall Speedway. With the points earned from his 1st place finish and 2nd place qualifying, Vaughn moves up to 4h place overall in the Formula Drift Championship. 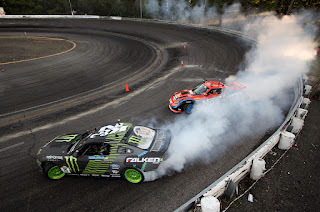 Next up for Vaughn on the FD circuit is Round 5 July 21 at Evergreen Speedway in Monroe, Washington. 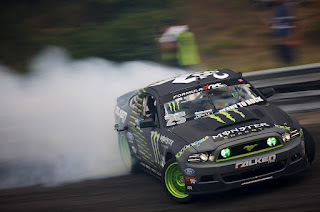 He plans to continue pushing hard in hopes of another podium finish and working his way up ladder in the FD points chase. 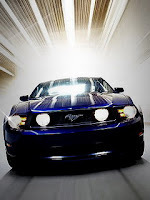 This entry was written by by Novocaine (Ford Mustang) and posted here on Saturday, July 28th, 2012 at 11:42 pm and is filed under Reviews, Sport. This article was not written by us, rather gathered using RSS feeds listed here. We take no credit for this article. You can leave a response, or trackback from your own site.